n partial knee replacement surgery, any one of the joints is replaced. 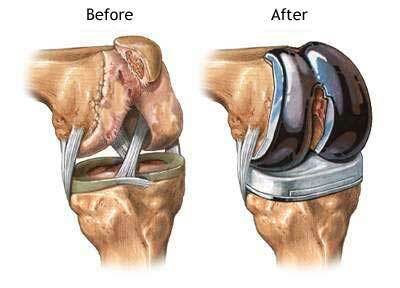 Whereas in total replacement surgery, both the knee joint sides will be replaced. There is no age limit to consider the surgery. Usually, surgery is suggested during the 60s and 80s in most of the cases. he surgery is to be done very carefully. The patient will be given any sedative to make her/him comfortable throughout the procedure. The patient will be kept in a bent position to get complete exposure of the joint surface. An incision of 6 to 10 inches will be made in the area, through which the surgeon moves the knee cap aside and cuts away the damaged part. After that, an artificial joint is attached to the surface. The doctor closes the incision after testing and ensuring the functioning of the artificial joint. In most cases, the whole surgery takes around 2 hours to complete. The complications and risks can be reduced with the help of the doctor. However, knee replacement surgery will give a significant relief to the patient suffering from knee pain and other issues. The patient will be able to recover completely in around two months of time.